Dave Richards - City of Largo Work Blog: What's Happening? Yet again a good number of days have gone by without a blog posting. Projects and upgrades have consumed most of my time in the last few weeks. NX 4 was released. I had installed and looked over various beta builds as it was being developed, and I put the released version on a VM copy of your primary GNOME desktop server. The install process is a piece of cake, and you just edit a few .cfg files to point to the right scripts to run at startup and away you go. 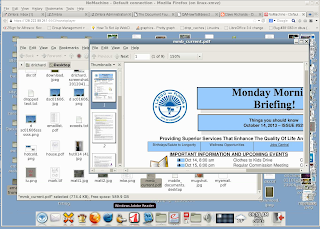 One notable feature is the ability to connect with a browser and get a full GNOME desktop and run all of your software without modification. As seen below, you enter a URL and up came the desktop. Speed on Firefox 24/Linux is very acceptable. Tablets have been interesting to me because one school of thought is that people would log in and get a GNOME desktop and work as they do from their desk. Another thought is that they would work more client/server and download documents and use local software and then upload. 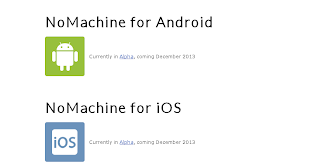 By far users have expressed more interest in the former. They don't seem to want to use different/local software and want to use what works here at the City. 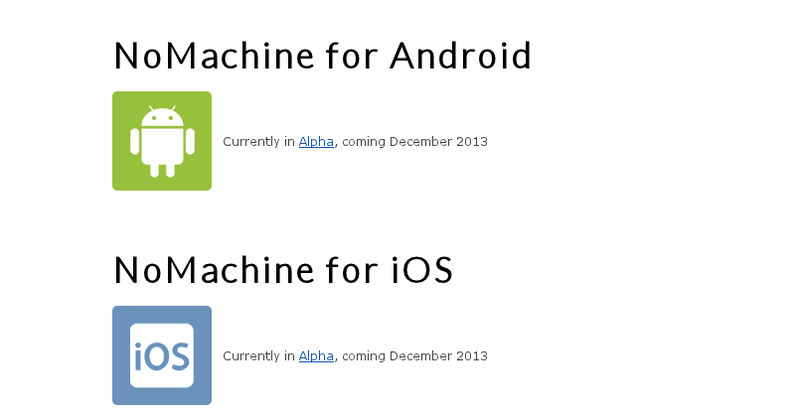 So the clients for iOS and Android will be greatly appreciated and used. The biggest issue for us right now with NX 4 is that the clients are not yet ready for deployment in a multi-user environment with "regular users". 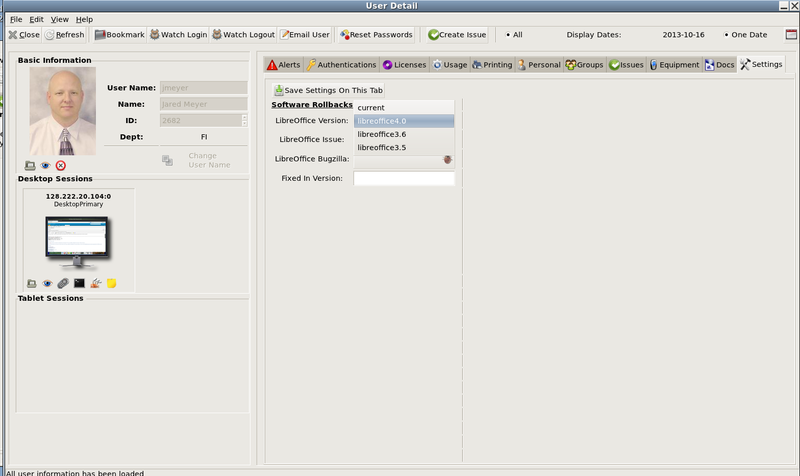 NX3 clients allowed you to automate the login process and once they entered their account/password...GNOME came right up. NX 4 has a lot of prompts and questions which are better suited for power users. As it stands right now, we would be bombarded with questions and support and there would be a drop in productivity. If a user is attempting to connect, they have work that must be finished. If they fail, that work doesn't get done. There are plans on the roadmap from what I understand to add more of these entperprise features in the future, and we'll have to wait for them before we can deploy. EDIT: Sarah from Nomachine posted information on this issue on the comments section. We were unaware and are going to test. Our in-house support portal is still helping us monitor all aspects of a thin client and centralized environment, and some modifications have been made. It's wonderful that when you have ideas, you can just throw in a few lines of code and it's done. (RED) Linux/GNOME/Desktop problems Only 1 all day! (BLACK) End user questions about working software or procedures. 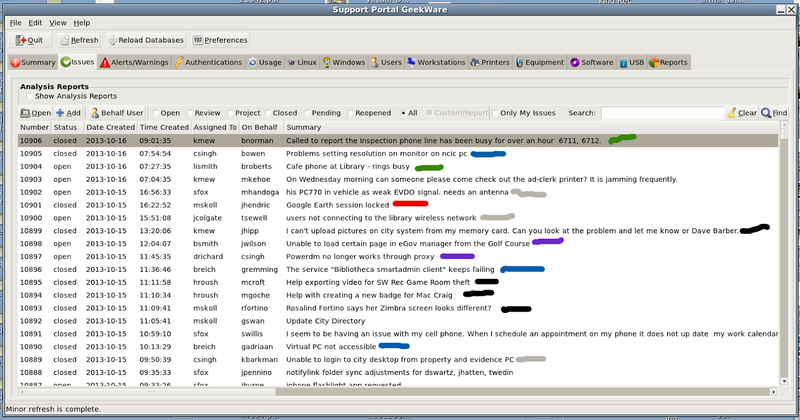 I also hacked in a quick screen on the user detail area to show documents edited by the user. Very often people call and have "lost" their document...or sometimes they make edits to a document in /tmp accidentally and then it's lost when this area is purged. Now at a glance we can assist them without having to look on backup tapes and such. Very helpful. This isn't unique to LibreOffice 4.1, because it's happened going back all the way back to OpenOffice 1.1. Whenever you get a patch or even more so, whenever you get a major release there are always issues where documents don't work correctly. I keep all of the old versions on the server and can always test and find the regression. Standard procedure then is to rollback a user until we get a patch and then upgrade them again to the latest release. This was done by me, with hard coded scripts. I put this into the support portal and now anyone in IT can either roll their own account back or rollback another user to solve these types of problems. All of this activity is logged, and we're nagged once a day of people on prior versions so that we continue to try and resolve their issue. We have three bad issues with LO 4.1 right now, affecting about a dozen people. 1) There is a bug with building graphs from spreadsheet cells 2) There is a bug for selecting sections of spreadsheets for printing 3) There is a bug with drop down cells in Calc. These users are on 4.0 and everyone is happy and working. Firefox 23 had an issue with saving files, the files were saved as 600 on Linux and no longer honored umask. When then happened was that work flow for many people was interrupted because as they shared files with others, they could not be opened. In general users do not understand how to use file permissions nor how to change them. The Firefox developers came through in a pinch and a patch is already landing in time for version 25. Thanks guys. We have three non IT people starting to test Alfresco 4.2 as a proof of concept. Deployment is not imminent at this point because we don't have the staffing; but it's gaining some steam and people are starting to see the power of working in this manner. The testers are putting PDF content into the Alfresco database and then seeing that it's immediately available on their tablets. We're meeting today again to discuss how to connect with LibreOffice, and will talk about the concept of using hybrid PDF as our official City file format. Right now LO is a bit clunky with this format, but we see possibilities I can start creating feature requests and possibly funding improvements. Alfresco supports RSS feeds, so I have been building a proof of concept systray application which would alert users of changes to documents and work flow that need their attention. 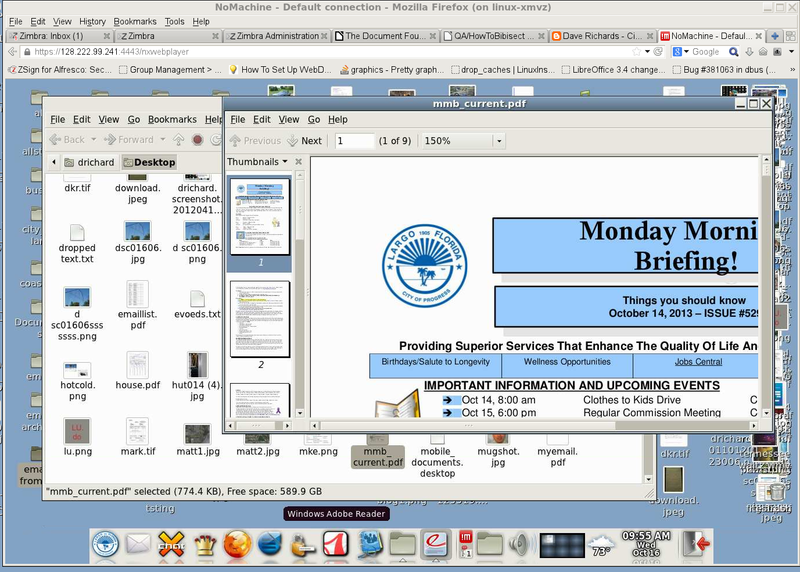 In the shot below, the icon is sitting in the tray and clicking on the icon shows the last document updates. At our meeting today we'll talk about this idea and whether we want to test notification popups too. The strength of open source: being able to rapidly build prototypes and then deploy solutions quickly with little to no cost. It's only a few weeks away, and I'll be attending along with my coworker. Find us and say Hi! 1. Your LibreOffice issues sound a bit concerning, but then, you seem to always switch to new major versions with ~x.x.1 revisions – which aren't actually recommended for large rollouts. Why don't you have some extended (opt-in) "beta phase" between x.x.0 and say, x.x.3, and then switch everyone else? Or is that a matter of getting the new features as early as possible? 2. The desktop you are using seems to be heavily customised. (And over the years we could also see you have a lot of fun with custom icons, wallpapers, GTK themes and Firefox personas. :) ) Have you thought about getting one of those "UI/UX nazis" on-premise for a few weeks to evaluate your default desktop? 3. Sometimes your support application seems to be pretty privacy-invasive, case in point: the "recently used documents" list. Have you gotten user complaints about this when they noticed what you are doing or are they fine with that? 1) You are correct, we don't ever do a X.X.0 upgrade and always wait for at least one minor level upgrade. The one thing that always gains traction around here is when DOC/DOCX/XLS/XLSX files don't open correctly. When we have upgraded, it's been because the newer version as a whole moves us ahead in this area. The filters are constantly improving and we begin to find the new version solves many problems. So it's kind of a situation where you take "10 steps forward and 3 backward". If we offer an opt-in beta, there would be only about 5 people that do so, and everyone else would stay on the old version....which is not a big enough sample size. We publish an article when an upgrade is done and tell people to call us immediately if they have problems, and the rollback can be done in just a few seconds. We're good about getting bug reports entered and the developers have been fixing them pretty quickly through the years. 3) All of our documents and work is subject to open records laws and any citizen can come in and request copies of documents that we create. So there are no issues where we are sniffing trade secrets or something that might be an issue in the private sector. The other issue is that these tools allows us to be proactive. There are a high number of users that will never call if they are having problems and then complain to their supervisors that the computer is broken. Through the years that has put us into uncomfortable meetings with angry people because these issues have not been confronted when they happen. So we aren't spying, but we can see problem trends and reach out to people and try and help them. Generally people are very happy to have help and appreciate that we are contacting them even though they didn't call our support group. Also, these tools allow me as a System Administrator to see failure points and things that I can improve. Users tend to find ways to work that you never considered, which is always interesting too. - User gets a document in email, opens it in /tmp and then hits the edit button and types for three hours without having put it into a proper folder for storage. /tmp is wiped at night via cron and on reboot and the document is gone. - User has no idea where they saved the document and can't find it, and they tell their supervisor that they saved it for sure and that our system is losing documents. - We have no record of this document and it was never backed up, and cannot say for sure what happened and cannot find it. Root cause is never discovered. 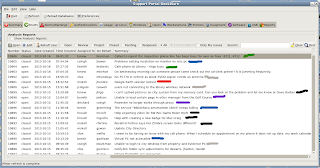 - User and their supervisor question network integrity. - With this option in the support portal, we can now see the file names of their edits and can easily see that they were editing documents in /tmp. Once you have activated this setting everything should work as in version 3.5.0. You should be able to create your pre-configured session files as you did before.